How can I use the Range Update tool? HOME > REVENUE AREA > How can I use the Range Update tool? I.e. : update rates, availability, open and close sales, aply minimum and maximum stay restricitons, CTA or CTD. For the same action, the hotel can update different values for several offers. STEP 1: Access the REVENUE tab, select TOOLS on the bottom left corner of the sidebar and choose the RANGE UPDATE option. STEP 2: Define the relevant dates that you wish to update, the week days if applicable, the Action, the channel and the offers. STEP 3: After performing the relevant changes click on the OK button. 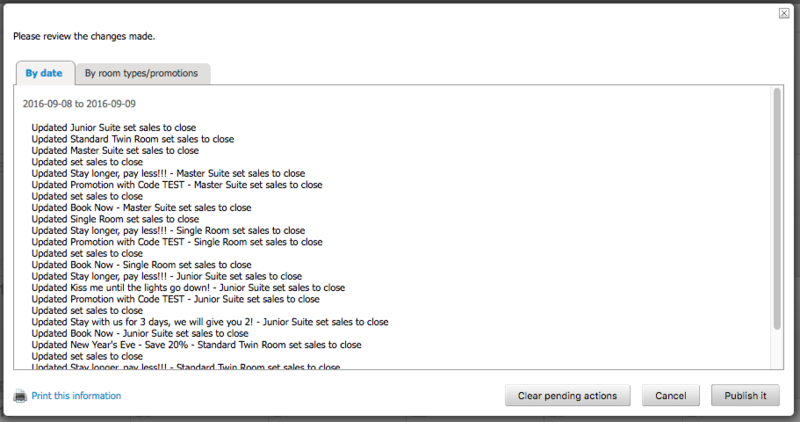 STEP 4: This feature will give you a chance to revise all the changes done, before making them available online. Please make sure you review this changes and click on PUBLISH IT. In case you wish to revert the actions done, prior to publish them, please click on CLEAR PENDING ACTIONS and those changes will not become effective online. if you click on CANCEL, this changes will still be available to review if you click on REVIEW AND PUBLISH CHANGES button at the top right corner of the calendar area. How can I check my Rates and Availability for specific periods? Under the revenue tab, and selecting a Room option on the left-hand side, the hotel will have e calendar view options: MONTHLY, BI-MONTHLY and YEARLY. This will allow the property to check the details of your prices and availability on a monthly, bi-monthly or yearly basis. 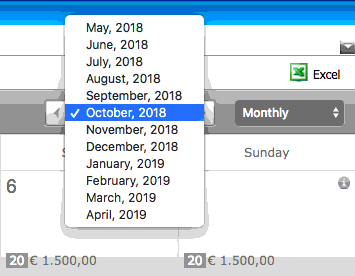 You can navigate/ change the months or years by using the relevant arrows, or by selecting them from the drop down menu. You can check your prices and/or availability to ALL ROOMS at the same time, or for each individual room separately, according to your selections on the left sidebar. 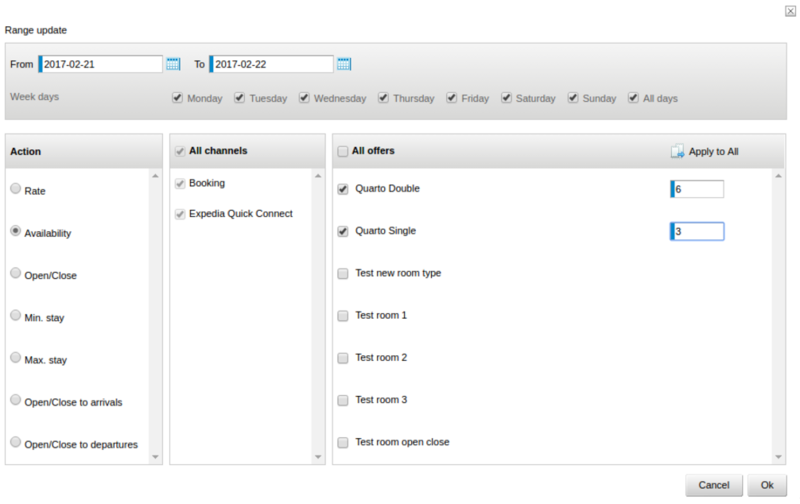 If you are checking ALL ROOMS at the same time, the prices displayed will be the BAR (Best Available Rate) and you will see your total availability, with no breakdown per room type.